Moving on from the institute, we begin Golden Son with Darrow leading his fleet against Karnus au Bellona, Cassius’s older brother. In what sets up like a Enders Game-esque battle scene, we are introduced to the downward spiral which is the rest of the novel. Darrow, having been contracted by his enemy, Nero au Augustus, has been released from said contract and is left to ponder how exactly he will enact his revenge. He once again turns to his friends within House Ares and is contracted in a plot to kill the Sovereign, but because no-one plays nice in Brown’s world, Darrow’s hand is once again forced and a new strategy will need to be put in place to bring the peace and equality to the peoples. A strategy where he will have to put his trust in some old and new friends, and even some unsavory acquaintances with their own motivations. 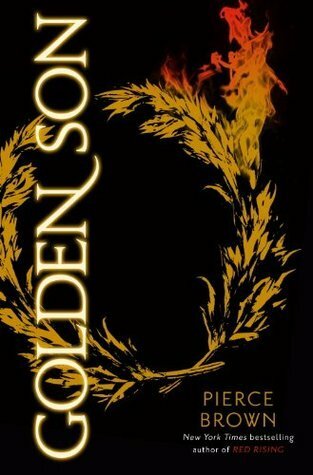 A story full of love, loss, intrigue, bloodshed, and plenty of twists, Golden Son outdoes its predecessor in epic fashion and sets the stage for another highly anticipated, and I’m sure to be brilliant, book in the Red Rising series with Morningstar. Brown continues to amaze me with his writing, especially with plot twists and characterization. The handful of characters we feel we are becoming so familiar with as readers continue to surprise us with their depth and I truly have no idea who can be trusted anymore. I once against went with Tim Gerard Reynold’s narration and, suffice it to say, I can’t get enough of his voice. He brings Darrow and Brown’s world to life with his perfect inflection and pacing. Keep it up, TGR! If you read Red Rising and are/were hesitant about continuing the series, I implore you to pick up Golden Son. You will not be disappointed.